Modeling math and equation goddess Lori Siegel recently sent along the latest version of C-ROADS (formerly called Pangaea) — the latest evolution of it since our partners at the Forum for Active Philanthropy stepped up to prep the sim to match the UN climate negotiation process more closely. This is the shape of things to come in two ways. 1. The shape of our simulation. We are working to create a simulator that will test the actions of the parties to the UN agreement in Copenhagen in 2009 — all ~14 parties. We’ll include them in the model, post it on the web for the world to test, and then share the code open-source-style so others can adapt it. 2. 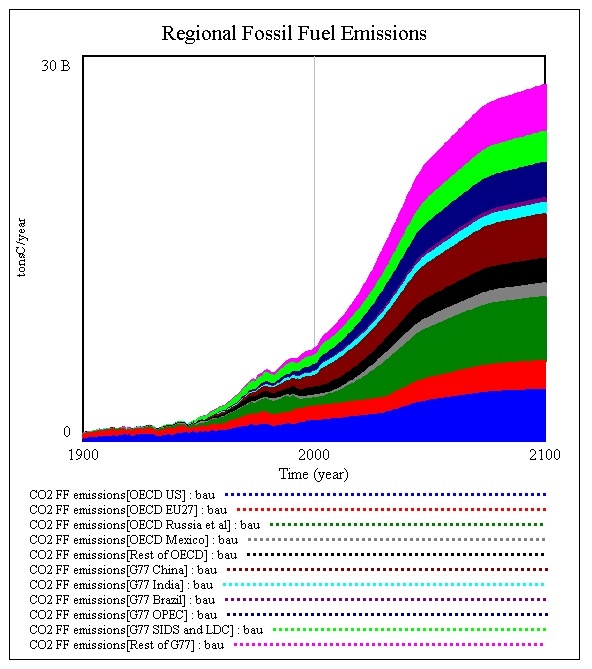 The shape of CO2 emissions for regions of the world under the IPCC’s “A1Fi” future scenario. We need to avoid this. Thought I’d post it since I’m excited for the progress (we’ll show this in Copenhagen at the end of November and in Poznan in December), proud of our modeler Lori for banging it out so fast, sobered by the ecological effects of all this, and a bit charmed by the pretty colors.